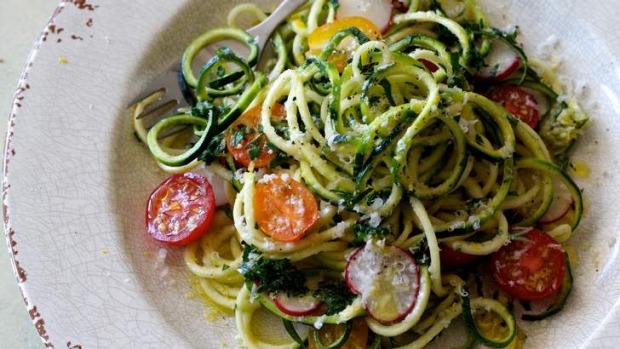 This "spaghetti" is made from zucchini, extruded through a vegetable spiraliser into long, curling strands of raw vegetable goodness. The garlic, lemon and parmesan really make it feel, and taste, like pasta. 1. Spiralise the zucchini, or use a vegetable peeler to shave the zucchini lengthwise, then slice each shaving into long thin strips. 2. Toss the cherry tomatoes and radishes with the olive oil, sea salt and pepper. Add the zucchini and lightly toss, then add the lemon zest, parsley, garlic and grated parmesan, and lightly toss until coated. Divide between two pasta bowls, scatter with extra parmesan and serve.